In this step we will create the windows for the application. In the previous step we already created the user controls. Windows are a great way to show in an edit-context. 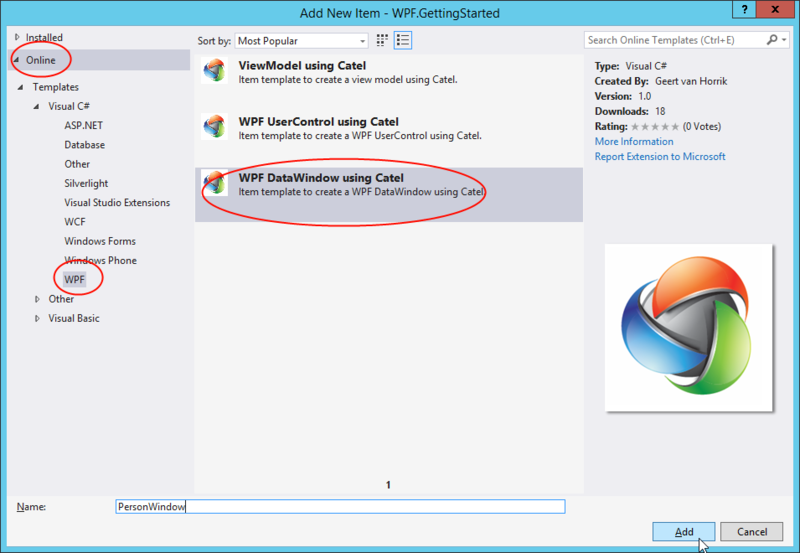 Catel provides great edit-windows in the form of the DataWindow. This is a window that automatically adds *OK* and *Cancel* buttons (but of course allows customization of the buttons and behavior). Give the new view the name PersonWindow. The view will be added to the *Views* folder. The FamilyWindow is a bit different because we want additional logic in this window. We want to create add / edit / remove buttons for the family members. Therefore we need to create a separate view model which contains this logic. Since the FamilyWindowViewModel will look a lot like the FamilyViewModel, just copy/paste the FamilyViewModel and rename the copy to FamilyWindowViewModel.